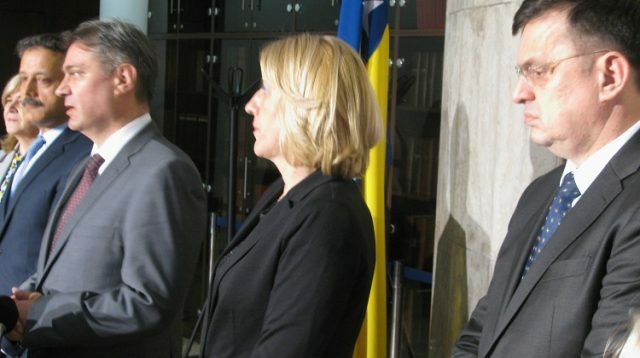 Prime Minister of the Republic of Srpska Zeljka Cvijanovic stated today after the session of Fiscal Council of BiH held in Sarajevo that the agreement on Credit Arrangement with International Monetary Fund has been reached in the amount of 550 million Euros. “The amount in question is around 550 million Euros, with withdrawal period of three years and grace period of four and a half years. After the first tranche, the repayment period is set to be 10 years and after the last tranche the repayment period is 13.5 years. This gives us wide space”, the Prime Minister said and added the Republic of Srpska would get one third of the designated amount. Prime Minister Cvijanovic also said that conclusion of this Facility Agreement activates some additional mechanisms which are related to the Reform Agenda including the arrangement with the World Bank and the European Commission. “We are expecting major financial support in the time to come and should be all aware of many important tasks we shall do”, Prime Minister Cvijanovic said. The Prime Minister also said that the Arrangement with IMF was intended to support the Reform Agenda and the whole number of system measures and important sets of reforms which all levels of governments pledged to implement in the forthcoming period. “Looking at the measures that we defined within this Arrangement, one could see a busy program which includes many activities for all levels of governance in the nearest future without any delays. We have agreed earlier to work on these matters which we finalized today”, Prime Minister Cvijanovic said. The Prime Minister specified that the meeting lasted for hours because the participants were working on specific details so that the Arrangement could be concluded on this date. Prime Minister Cvijanovic particularly stressed that the final text of the Letter of Intent required major engagement of all stakeholders and implies no obstructions from any level of government. “The Government of the Republic of Srpska worked hard on the measures which have been defined and included in the Arrangement. All those measures are good system measures that we must implement with or without IMF, today or in few years from now … so we decided to start as of today within the entire arrangement of support to the Reform Agenda”, Prime Minister Cvijanovic said. Chairman of the BiH Council of Ministers Denis Zvizdic emphasized that numerous structural reforms were included in the Letter of Intent. “That is the matter of serious arrangement of different financial and fiscal systems and technical support which would be provided by IMF in monitoring such measures. Many laws would have to be amended and systems corrected which had showed certain weaknesses”, Zvizdic said. Prime Minister of the Federation of BiH Fadil Novalic stated that the Credit Arrangement with regard to business associations foresaw continuation of privatization, restructuring and better business management. Head of IMF Mission to BiH, Nadeem Ilahi said that representatives of this financial institution had talks with BiH authorities for two weeks and that the Arrangement was subject to approval of the IMF Executive Board. “This is Extended Fund Facility of three years which foresees certain extensive and significant measures. Economic assessment is very important. There has been certain economic recovery and we expect the growth to reach 3.0 percent this year. Inflation has been low reflecting low euro area inflation”, Mr. Ilahi said.